What do you do when you need extra speakers for your PC, but do not have the desk space necessary to accommodate your needs? You certainly should not have to just accept what your desktop or laptop setup has built into it. What about a system like a Nintendo Switch? You are on the go, playing in TV mode with people, but the built-in speakers can’t be heard over the sounds of the people around you. You deserve something that is reasonably priced, considers your needs, fits your space and maybe even looks good while doing it. This is when gamers would need to turn to Creative for their Pebble. These $24.99 USB 2.0 desktop speakers are cozy little buddies who will make your game sound better and not take up too much room. 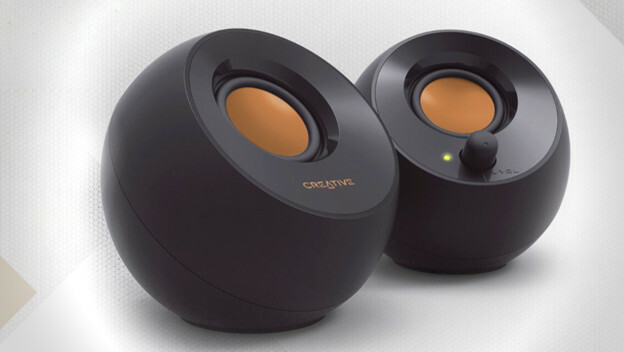 Creative’s Pebble speakers are designed to offer as much punch as possible for the size and money. Each one has a 2” full range speaker driver in it, with a 100Hz to 17kHz response to more than adequately cover higher sounds, bass tones, and natural voices. They have an 86db signal-to-noise ratio. It also has a 4.4W root mean square, which shows it is capable of hitting the sorts of peaks and averages you might expect from a larger speaker, let alone one from this diminutive size. It generally provides a rich sound that lets you catch all the details when you are playing a game. The way the Creative Pebble is arranged is interesting too. These are speakers that are tilted up to face you when placed on a table below you. This is not just to make them look good, as there is a method to the madness. This is a 45°angle designed to be aimed directly at whoever is above, listening to the audio while using a computer or device. The far-field drivers themselves are even custom-tuned for this position, to make sure you are getting the best possible sound that is targeting your ears. Not to mention, this position leaves plenty of room for controls on the speakers’ face so you can immediately control the volume without looking for buttons on your computer or system. These are great for both having on your desk and carrying them along when needed. Each one is only 4.4” wide, 4.5” tall, and 4.6” deep. You can easily fit one in your hand and each weigh under one pound. They are powered by plugging them into a desktop or laptop’s USB port or via a power adaptor, which means they can work almost anywhere. This means you could easily have these guys out on your desk at all times while you work and game. Or, if you were heading out somewhere, it would be no trouble to toss these sturdy fellows in a bag and bring them along. And since they use a 3.5mm connector, you know it will work with multiple devices. And of course, there is the form element. What is cool about the Creative Pebble is that their name comes from their inspiration. 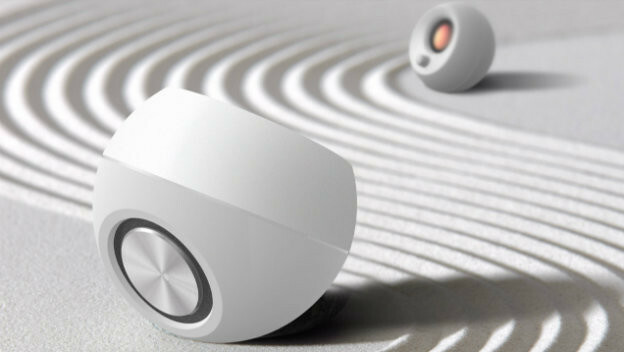 These speakers were inspired by the pebbles you would see in Japanese rock gardens. You can get them in black or white, and they are these nearly perfect little spheres that happen to have the right indentations to perch on a desk without tilting or angle sound up toward your waiting ears. If you are considering taking them everywhere with you, the black model might be best since it would hide any possible dirt, but the white model would look crisp on a desk in a more stationary position.